What a location – right on the famous Mission Beach boardwalk steps away from the beach! Rockaway Oceanfront 2 is a beautiful beachfront vacation rental with 4 bedrooms, 3 baths and overlooking the boardwalk, sand and crashing waves of the Pacific Ocean. Large bay windows and multiple outdoor decks let you experience all that oceanfront living has to offer. This condominium home is located on the 2nd floor providing privacy, quiet and safety. The home is nicely appointed with wood and leather furnishings, travertine floors, granite countertops and a modern, well-stocked kitchen with stainless appliances. Other amenities include a large flat-screen HDTV in the living area and all 4 bedrooms have flat screens as well! The open floorplan comes with plenty of indoor and outdoor spaces where you can enjoy the sights and sounds of Mission Beach and the Pacific Ocean. Mission Boulevard is just a short block away with multiple restaurants, beach eateries, coffee shops, bike rentals, surfboard rentals, apparel shops, beach shops, surfing lessons, etc. This Mission Beach San Diego vacation rental is located halfway between the Pacific Beach Pier and the famed Belmont Park roller coaster. Please note: This home is located in a 3-story complex with neighbors above and below and is only suitable for quieter groups. Deposit forfeitures and evictions are strictly enforced for contract violations. Please make sure you are comfortable with these policies before renting with Bluewater. Please note: Most alley ways, parking spaces and garages in Mission Beach do not accommodate larger vehicles, especially trucks and SUVs. There are no refunds if your vehicle does not fit in the parking space provided. Our experience with bluewater was exceptional . They replied quickly to my questions prior to checking . Check in & out was very simple . We were very please with this property . The layout & space was perfect for our family . Everything we needed was provided & things we needed were easily found at the local grocery store . We were able to park a suburban & a compact car in the garage . Beach chairs & supplies were available in the garage as well . Laundry supplies were provided which made keeping towels clean - easy. This is a fantastic property - we couldnt have been happier . Amazing home and set up. We really enjoyed our stay. Bluewater even called us to see if we needed anything. Highly recommend them and this beautiful home. This was a wonderful place to stay. Very roomy for 7 adults. The WiFi needs to be enhanced. We could only get a decent signal in the living room. This was our 4th annual stay. We are tentatively planning our annual reunion for next year at Rockaway II. The staff was awesome and pointed out a property that was amazing for my boyfriends 40th bday celebration. The list of things to do and directions ahead of time was awesome. The Rockaway Oceanfront II was amazing! We saw dolphins from our bedroom 2 of the 4 nights we stayed there. We enjoyed dinner on the balcony while watching the sunset and then played games around the nice dining room table at night. LOVED how comfortable this location is! Bluewater Vacation Homes was great to work with and they made everything so easy. We will definitely be using them again in the future. The location was great and it made our trip one we will never forget. With a couple changes this home could be a 5 star rated home! Reviewer Location: Glendale, AZ - Date of Arrival: April 2, 2016 - Review Rating: 5 out of 5 stars - Review: "Great location" - "This property was great for our family and our 65th Anniversary celebration. There were bathrooms for everyone and each bedroom had a balcony. Since it was on the 2nd floor the view was amazing and we didn't have people walking by staring at us. The balcony off the living room was very spacious and a wonderful place to kick back with a glass of wine and watch the sunset. The property was clean and well maintained. Bluewater Vacation Homes was very professional and made the rental process easy. We would definitely stay here again." Reviewer Location: Lawrence, KS - Date of Arrival: May 21, 2016 - Review#:1430134 "Awesome ocean front condo" - Review Rating: 5 out of 5 stars - Review: "Excellent stay! Magnificent condo! Awesome views of the ocean and its was perfect being on the second floor with lots of privacy. We had an awesome vacation thanks to the stay at this gorgeous beach front property!" Review #5759245 First Class - We had a fantastic long weekend at this property. The layout is fantastic and every room is nice. The kitchen was top notch and is wide open to the living room so everyone can hang out together. One of the better features is the large patio overlooking the beach with amazing sunset views every night. While it does have a garage everything is close enough to walk so you could simply take a cab from the airport which is also close. Highly recommend this property. 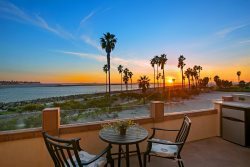 Reviewer Location: Marcellus, NY - Date of Arrival: February 13, 2016 - Review Title: "Beautiful rental, amazing view of the ocean, great location" - Review Rating: 5 out of 5 stars - Review: "This was our first time in San Diego and this rental was perfect for us. The views of the ocean were amazing. Loved sitting on the balcony watching the sunset every evening with a glass of wine! It was great being on the second floor as it offered some privacy from the people on the boardwalk. The beds (and pillows) were very comfortable, and the kitchen was very well stocked including nice appliances . The furniture both inside and on the balcony was very comfortable. Everything was very clean and in great shape. The location is great because you can walk to many restaurants, bars, and a grocery store. The airport and the zoo were close to drive to also." Reviewer Location: El Dorado Hills, CA - Date of Arrival: August 13, 2015 - Review#: FK - "If you hate the beach...don't stay here!" - Review Rating: 4 out of 5 stars - "Take the first step into this home-it's is a ooooo and a ahhhh with full frontal beach view. Fantastic beach front home one story above the beach walk which made for great people watching & privacy. Ample room for family & kids to hang inside & out. The perfect home for a family reunion. Planned on BBQ'ing the first night and we just got started then ran out of fuel-had to cook indoors :-(. Called Bluewater and had fuel delivered 1st thing in the am :-). You are literally 10 steps from the beach. Grabbed a chair & umbrella from the garage and spent the day on the beach...life is good! Mission Beach is an eclectic beach town and we enjoyed it very much!" Review #4798021 Anniversary Celebration - A group of us came out to celebrate our 11th anniversary on 11/11/11 and this place worked out perfectly. At first, we were a little worried the size would not accommodate us, but Kendra was very comforting and reassured us that we would all be very pleased. We could not be more pleased. All of our guests were beyond impressed. The location was perfect, the view was perfect, and we were all very comfortable. We used the fire pit so much that we ran out of propane, but that was only because we put it to good use. This event was very memorable for us. We would definitely rent this place again. We liked being on the second floor because it kept us above eye ground to see everything. We visited a couple of restaurants, we walked the beach, ran surfed, you name it, it was available. Liquor store a block away, grocery store...blocks away. We could not have asked for a better place for our special event. Thanks! Please note: A government-issued ID and credit card used at booking must be presented at check-in. Guest age requirement is 25+ unless children accompanied by parents. Parties, excess noise or violating maximum occupancy are prohibited and will result in immediate eviction with no refunds.